Khaled Hosseini’s sad tale of an Afghan family – And the Mountains Echoed – opens with a bedtime story telling of the sacrifice of a child to a mythical creature to save the village – a not so subtle representation of the narrative that follows about a poor Afghan village boy, Abdullah, and his three-year-old sister, Pari. Pari is sacrificed as a young child to a wealthy childless family; in exchange for her “adoption,” Abdullah’s family receives money to survive. Their disparate lives form the plot, through flashbacks that slowly reveal their destinies. Hosseini builds the story through a series of connected short stories across fifty years, told by different characters, all touching the lives of the brother or the sister. Sacrifice and selfishness are simultaneous themes, from the uncle who has arranged the sale of his young niece to the doctor who eventually lives in the house where she grew up. The setting moves from Afghanistan to Paris to California, clearly identifying how the difference in surroundings affected possibilities. Hosseini documents the history of his native Afghanistan as it evolves through wars and westernization, and reveals the traumas of those who remain and what happens to those who leave and then come back to rediscover their country. 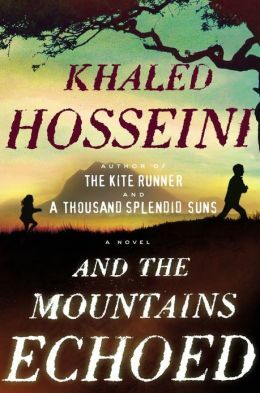 Characters are complicated; Hosseini deftly creates the stereotype, then shatters it with an unexpected twist: the glamorous greedy Nila revealed as a devoted mother with a tragic past; the dedicated Americanized doctor who defaults on his promise; Parwana, the loving younger sister with a betrayal that haunts her through a lifetime of misery. The story moves tangentially across generations, switching narrators effortlessly. Characters I had dismissed as minor reappeared with unexpected depth. Hosseini makes good on his promise to tell a good story and left me with the feeling that I would need to read it again to understand and appreciate the nuances. Like his first novel, The Kite Runners, this book offers a personal view of lives – who, depending on the grace of birth and circumstances, could struggle, succeed, or merely fade away – but always leaving an indelible mark.